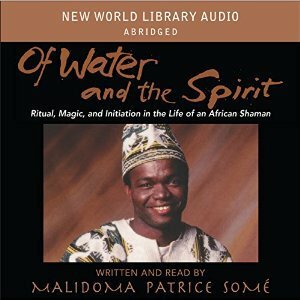 My Black Panther Moment | Kam-Au Amen & Co.
After having watched Black Panther, I can’t help but think that now is a great time to revisit the book Of Water and the Spirit: Ritual, Magic, and Initiation in the Life of an African Shaman by Malidoma Somé who hails from Burkina Faso. Reading his book back in the early 2000s was my first engagement with an existing reality from a part of the African life that was virtually untouched by Western influence, and where the accounts of real events were delivered to me as if they were from a science fiction film - literally accounts of otherworldly occurrences. I was undertaking cultural analysis through film at the time and the book impacted me tremendously. It influenced some ideas in my MPhil thesis, and since then the combination of otherworldly phenomena (‘science fiction’ as we term it, and now ‘Afro-futurism’) and Africa have never seemed distant or incongruous to my mind, because as Somé dutifully documented these experiences were routine in ritual. Black Panther has visualized this reality in many ways. I recommend grabbing a copy if you haven’t yet read it. It will change your world, if even in a small way. “What does Wakanda have to offer the world?” When the time is right you’ll have an answer, sir! In 2002 I submitted a thesis to the University of the West Indies in the completion of my studies for the MPhil in Cultural Studies. The concern of my thesis was an examination of the Jamaican cultural identity through film. I enjoyed the project immensely. Despite some encouragement, I never did publish any aspect of the work, which perhaps I should have, but I’m satisfied that at the very least it yielded what seems to the time-tested BA in Entertainment and Cultural Enterprise Management. Besides, if you survive, who knows? It may be your turn to eat tomorrow. Your son may bring home your share. The events unfolding in a science fiction film, considered futuristic or fantastic in the West, were perceived by my elders as the current affairs in the day-to-day lives of some other group of people living in the world. The elders did not understand what a starship is. They did not understand what the fussy uniforms of its crew members had to do with making magic. They recognized in Spock a Kontomble of the seventh planet…, and their only objection to him was that he was too tall. They had never seen a [Kontomble] that big. They had no problems understanding light speed and teleportation except that they could have done it more discreetly. I could not make them understand that this was not real. My elders were comfortable with “Star Trek,” the West’s vision of its own future. Because they believe in things like magical beings (Spock), traveling at the speed of light, and teleportation, the wonders that Westerners imagine being part of their future are very much a part of my elders’ present. The irony is that the West sees the indigenous world as primitive or archaic. As with most academic work, the study takes the researcher in directions not previously anticipated. This research has led us into the field of cultural industries as regards Jamaica. The findings suggest that the state of Jamaican culture at present is partially determined by the impact of the products of the global cultural industries on the society. In present day Jamaica, some action can be taken in order to influence the film practice towards the vision mentioned above. Certainly, when dealing with the broad entertainment and cultural industries at the level of training, some basics are being demanded. I have attached to this thesis a proposal that was put forward for approval that directly impacts the issue of training [proposal for a bachelors degree in Entertainment and Cultural Enterprise Management]. The industry is in need of suitably trained managers and entrepreneurs who are willing to take the necessary risks to explore the economically valuable products that emanate from our culture. The proposal was structured in direct response to the contemporary issues that are being raised by practitioners within different segments of the cultural industries, as well as from the demands that are being made by the human resource departments of some of these enterprises. there is a fundamental difference in approach between movies which attempt to provide enjoyment and relaxation, and films which attempt to convey enlightenment through challenge and involvement. The former approach is the much more common one, given the high level of funding involved in production. Audiences must be attracted to provide revenue to cover costs and provide a return on investment, and this is done by “giving the people what they want.” While art may be the result of such a quest, it is more a by-product of the process than a primary focus. In Jamaica, all the productions so far have aimed at commercial success, and in their own way, have tried to be true to a particular perception of Jamaican reality. So far, few of them have brought in substantial economic returns or have struck a chord with a mass audience. The notable successes have been The Harder They Come, Dancehall Queen and Third World Cop. The Jamaican film industry needs to be integrated with the music industry, and while doing this, should not limit its themes to ghetto life or exotic adventures, but rather produce music videos with film clips, interactive and enhanced CD’s, soundtracks, “making of the film” documentaries/promos and star interviews. The aim should also be to target non-Anglophone markets (Spanish, French, Portuguese and Japanese) and to develop website support and distribution. The strategy is to plan for these in the process of production planning, which increases capital input, but conversely greatly increases the chances of making a profit from the production. Add tie-ins and other spin-off products such as clothing, toys, books and other merchandising options and the possibilities are endless. Therefore, if the concerns are about promoting the culture, then the process of marketing involves just that – a reproduction of the culture in ways that are contemporary. This is the ultimate message that the Right Excellent Marcus Garvey tried to impart; a message that based on the present state of affairs was apparently missed. It is clear that if the culture’s ongoing subjugation is of concern, then the contemporary environment needs to be engaged with unity, vision and good sense. Equally, it should be recognized that the Jamaican identity is a fluid phenomenon, and one that is constructed from moment to moment. Identity therefore, is not to be discovered; it is to be constructed. This forever will be an ongoing enterprise of human re-engineering.